Erie Otters center Connor McDavid isn't the only high-end prospect eligible for the 2015 NHL Draft preparing to showcase his skills for the many fans and scouts in attendance at First Niagara Center in Buffalo, N.Y. on Wednesday. While McDavid is unquestionably the main attraction in the Ontario Hockey League regular season matchup at the Sabres home rink at 7 p.m. ET, there are other players hoping to have an impact on the outcome. Erie forward Dylan Strome, the brother of New York Islanders forward Ryan Strome, was given an A rating on NHL Central Scouting's preliminary players to watch list for October. 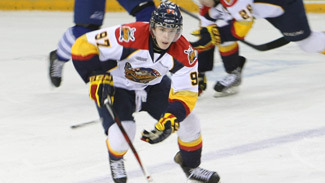 Strome (6-foot-3, 187 pounds) is second in league scoring behind McDavid with 23 points (seven goals, 16 assists). "I don't think [teammate] Dylan Strome gets enough credit," McDavid told NHL Live on Tuesday. "I feel he'll be a top-five pick in the 2015 draft." Other players to watch for Erie include B-rated defenseman Travis Dermott (6-foot, 197) and C-rated defenseman TJ Fergus (5-10, 170). Dermott has one assist and a plus-3 rating in three games and Fergus has produced four assists and a plus-2 rating in five games for the Otters (8-0-1). Niagara (2-7-0) has two B-rated skaters, including left wing Graham Knott (6-3, 192) and defenseman Vince Dunn (6-foot, 182). Knott leads the IceDogs with three goals and seven points in nine games. Dunn has two goals and five points in nine games. Players with a B rating are projected to be a second- or third-round selection at the 2015 draft. Additionally, left wing Hayden McCool (6-3, 200), a C-rated prospect, has two assists and a plus-1 rating in nine games for Niagara.